We have prepared nine eCommerce new year’s resolutions ranging from easy to challenging and being proficient at any one will have significant impact on your ability to drive success to your eCommerce ventures. Nevertheless, as with any worthwhile endeavour, each will require persistence and consistency. Get cracking! 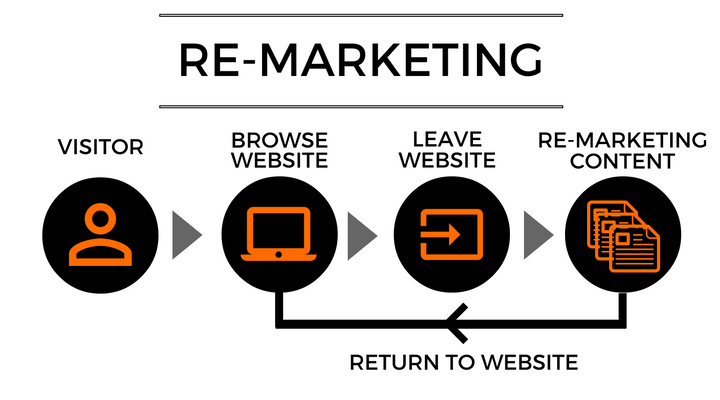 Save more abandoned shopping carts this year by developing a full cycle re-marketing system. 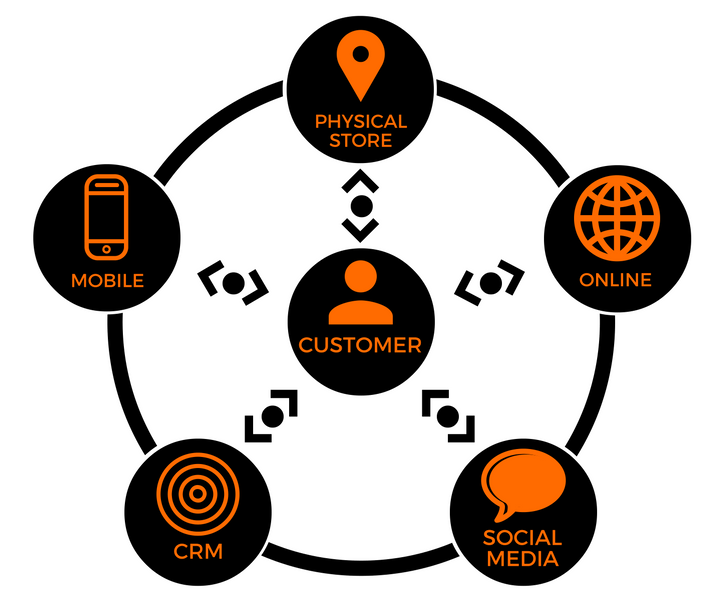 Segment your shoppers into their respective groups based on their actions (or non-actions) and present each group with relevant messages that urges them to complete their transactions. 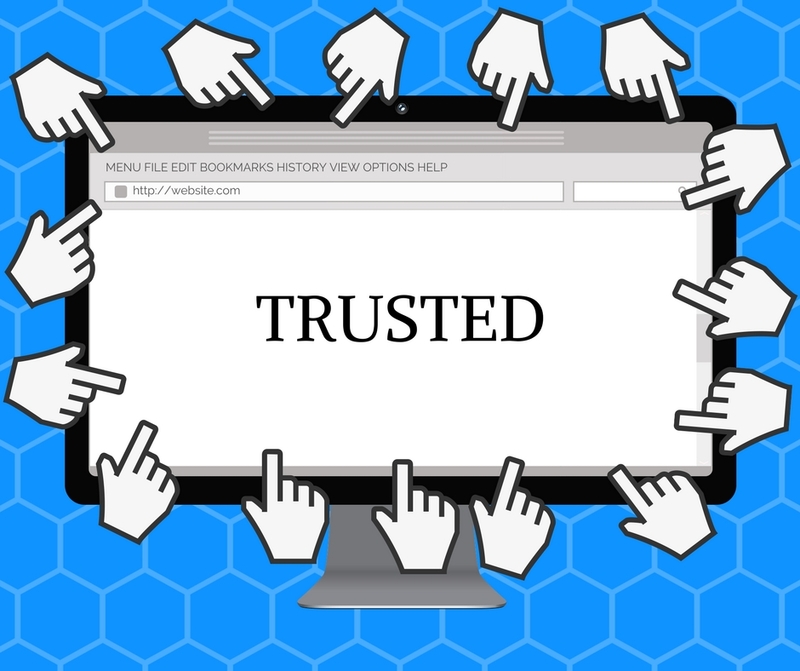 Have you ever visited an online store and then for weeks after seen that brand appear on your social media feeds and all across your regular news and shopping sites? That’s re-targeting at work. It’s part of a full re-marketing strategy. 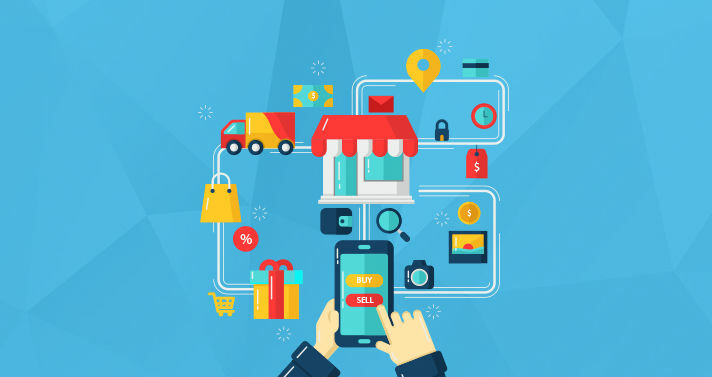 eCommerce presents the opportunity to offer a uniquely personalized experience to shoppers and is what sets us apart from brick and mortar stores. Test different tactics with each group and find what works best. New users who abandon their carts are likely to respond to promotions like first-time purchase discounts. There are also those that visit your store multiple times and check out several different products, without making a purchase. 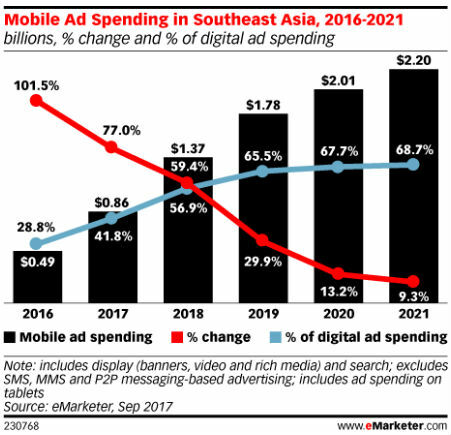 You’ll want to monitor such activity and have separate campaigns with different messages for each of these user segments. You also have the option of setting up automated re-marketing via services like Retai.ly which takes care of all the re-targting advertisements and helps you close sales from dropped users. Think of your social network pages as a person, rather than online applications. Behave as though it is an actual human by interacting with people, making friends, and as with the offline world, don’t be afraid to make (a few) mistakes. Share your joys and hopes and apologize for your shortcomings when they do occur. 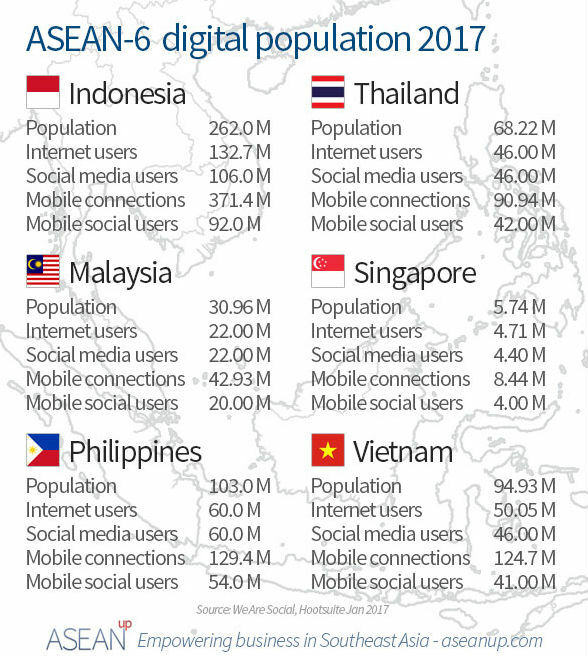 Pick one social platform that you want. They each have their particular area of expertise with which to increase your skills. For example if you want to try social ads, Facebook is where its at. You can build very robust campaigns and bolster your marketing prowess through Facebook advertising. Facebook has a tonne of options besides paid advertising. Join groups and engage with the communities, or create your own. Have you created events on Facebook before? 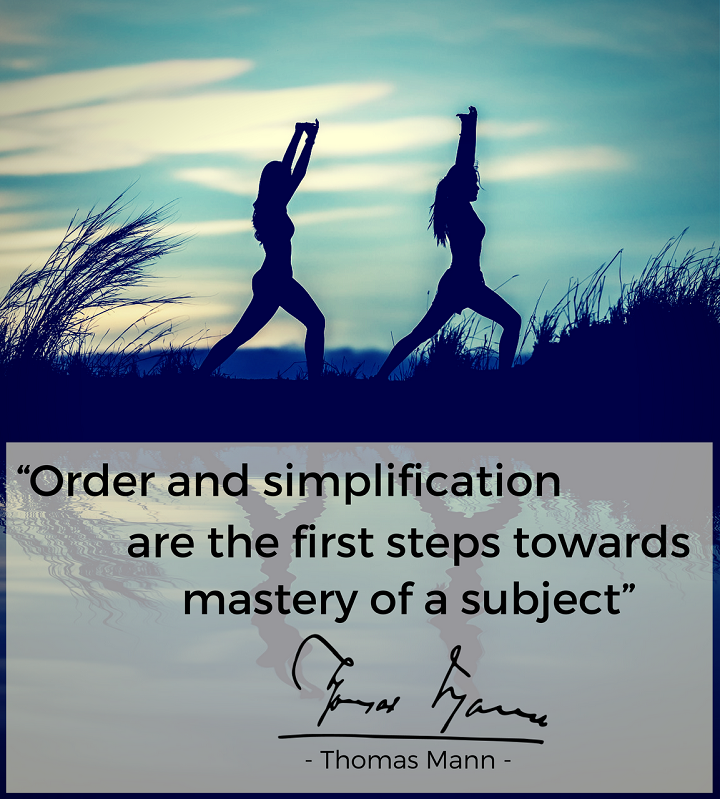 In fact, if you choose to be a master of Facebook, you’ll certainly have to take some time off your regular schedule to explore every nook and cranny on the platform. That way you’ll have a working idea of what sort of options you have available. 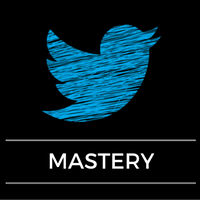 Jon Loomer has without question the top resources for mastering Facebook. 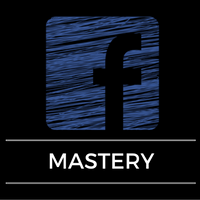 If you’re looking to master Facebook marketing, go learn from the best. Instagram is great for those who are visually adept to showcase aesthetically pleasing visuals. However, even if you are design impaired (like myself…), it’s a very forgiving platform to improve your eye for design. The platform comes with a myriad of filters and tools to help you craft appealing images. You can take your work to even greater heights with the help of third party online image editing software like Canva and Piktochart, which enable even untrained amateur designers to make stunning images that IG champions will appreciate. If you are a wordsmith then you will find Twitter to be your cup of tea. Twitter is all about honing your copy writing skills in 140 characters. You can pair each post with images as well to tell an even more compelling story, but the real challenge is being able to craft the perfect message with just those limited characters. That said, Twitter is no one trick pony platform. For example, you should create your own category lists like “Influencers”, “Ambassadors” or “Collaborators” and add relevant people to them. These lists can then be used for anything from content curation to content promotion, or any other creative ideas you might conceive. This is the platform for you if video content is your thing. It really doesn’t take a lot of learning before you have your first video up. Video is where the bulk of audience engagement lies these days and YouTube is the place people go to search for videos. Product videos do very well when placed on your product pages, and it also helps drive traffic to your page since people searching for product videos on Youtube (and other video platforms) will be able to follow links back to your site. 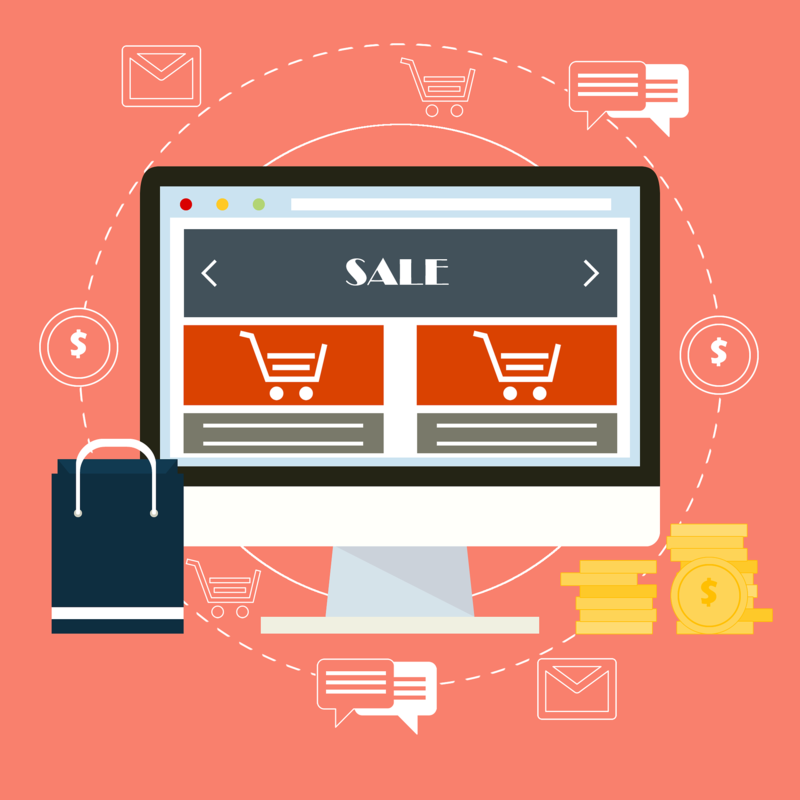 During the typical customer journey, people will search for reviews and tutorials of the products they are shopping for, so concentrate your efforts on those types for your product pages. However, don’t let that stop you from creating less promotional and more artistic videos to share with your audience, especially if they are relevant to your business. 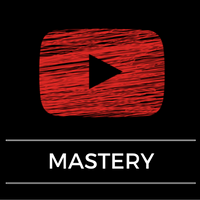 Should this be your chosen mastery it will prove worthwhile in the long run as mastering it means by the time you have several dozen videos created, you will likely also have learnt as many new video editing and directing techniques. All that on top of the numerous ways to promote your content and engage with your audience. Whether it’s a back-end software to make your life easier (and grow your business), or a front-end app for your customers benefit, pick one and get it working at its fullest potential. 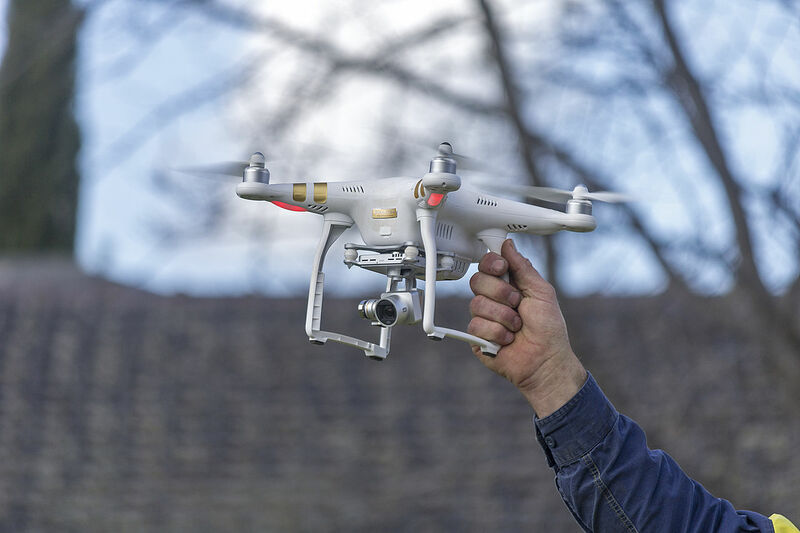 These technologies can be implemented with minimal effort (and minimal results), but to reap entirely the rewards of your investment, you should take the time to grasp how it works, learn the best practices and test it out yourself. For example, implementing an analytics suite for your eCommerce store may seem like it requires comprehensive technical knowledge, but highly visual Drag’N’Drop software such as Mixpanel make the tasks achievable for even those with minimal tech savvy. At the end of the day you’ll have a ton of data shwoing how shoppers experience your site and which areas you should take steps to optimize. 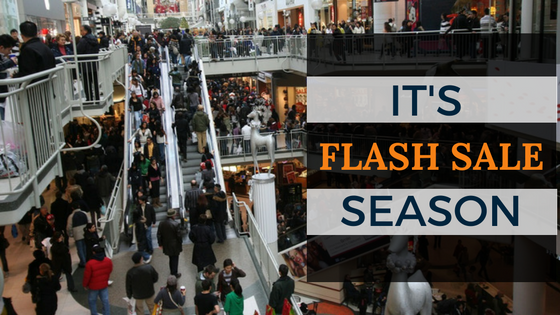 Flash sale modules don’t even require much back end implementation, but learning best practices and how to implement them so both you and your shoppers enjoy the maximum benefit requires time and experimentation. Learning to track and analyze link clicks will help you optimize your social media performance by showing you which posts get the most clicks. Eventually you will graduate to site wide tagging with a tag manager(the sort used by big league eCommerce players), but you’ll surely have someone or a team to implement it properly. If you plan on only one undertaking throughout 2017 OR if the idea of expressing yourself by educating/entertaining people interests you, this should be it. Your blog content can be in any form, from a traditional written blog, to videos, image galleries, or even podcasts if can manage it. Blogging is part of the content calendar, but I like to plan it separate from other content since I’ve done enough of both to know how to integrate the two efficiently. For example I always leave space in my social media post schedule for when I know I’ll be publishing blog content so I can promote that instead. Sometimes I decide that the promotion of blog content will not be part of normally scheduled social posts but will be in addition to it. The thing about blogging is that I spend most of my time promoting the content than creating it, so it reaches as many people as possible, thus driving more traffic to the site. So when I suggest blog regularly, I don’t mean to endlessly create content. Rather, the entire cycle of blogging starts from research, moves to creation, then to publishing it. But it doesn’t end there, as this is when you begin relentlessly promoting it. 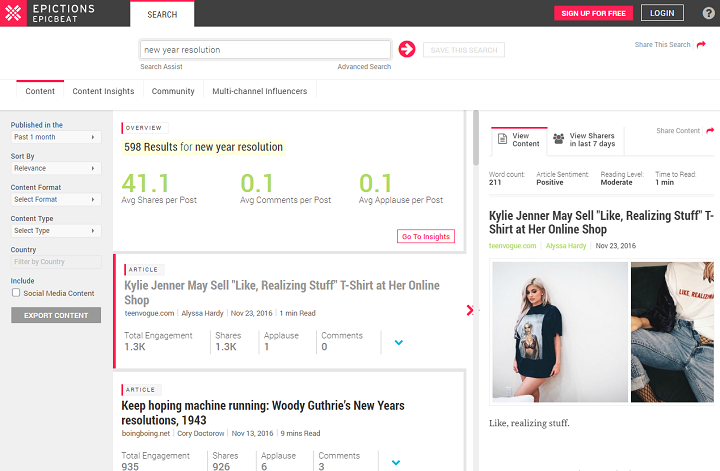 I use services like Epicbeat and Buzzsumo for finding types of content that people share a lot so I can figure out what I will create, as well as finding influencers I can reach out to on social media when I’m ready to promote to people who would find my content worth sharing. Keep in mind that although blogging and regular content updates have a significant impact on your search engine rankings, blogging for SEO is a long term goal that requires commitment and consistency to see results. Don’t jump in expecting to deliver an immediate surge of traffic to your site through blogging alone. 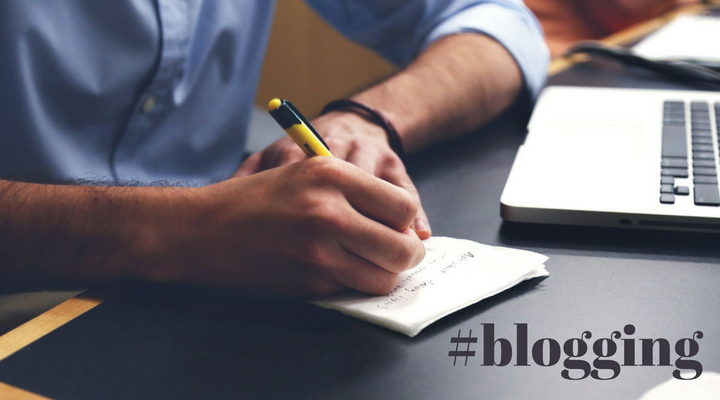 Have a look at other popular blogs both within and outside your niche. 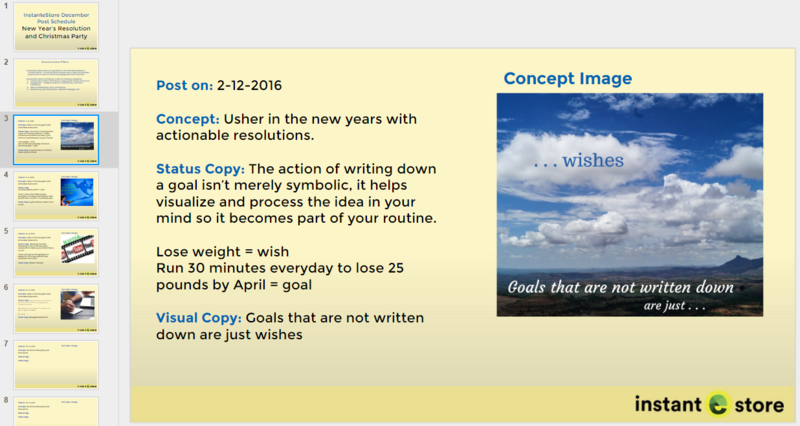 Besides giving you ideas about content and styles, it will keep you motivated and inspired to continue throughout the year. Companies that leverage social events like valentines, children’s/father’s/mother’s day, school holidays, and Halloween have the advantage of staying in topical conversations. I usually see F&B companies take the lead with topical promotions, but anyone can get in on it, even eCommerce merchants. February 5th is Super Bowl Sunday, consider creating a promotion that takes advantage of the amount of exposure the event receives, with a football theme or offering promotions related to the game. Earth Day on April 22nd is when you could show your support for our collective home by donating a percentage of profits to earth-friendly causes, and remind your readers that by shopping online they are also helping to reduce their carbon footprint. By planning and consistently running specific promotions centered around such events, you are building brand awareness by being in hot conversations. Planned correctly, you should also see increased seasonal spending with your brand. Take the time to grow your brand on previously untouched channels. If you’ve never sold on Amazon before, now is the time to think about being a merchant on their platform. Or if you’re in the arts and crafts market you could do well on Etsy. When the time is right you will even want to take your business to the physical dimension, but for now, just make sure your brand is visible everywhere on the internet. You should be being willing to sell anywhere and everywhere that there are customers willing to pay you for your products. 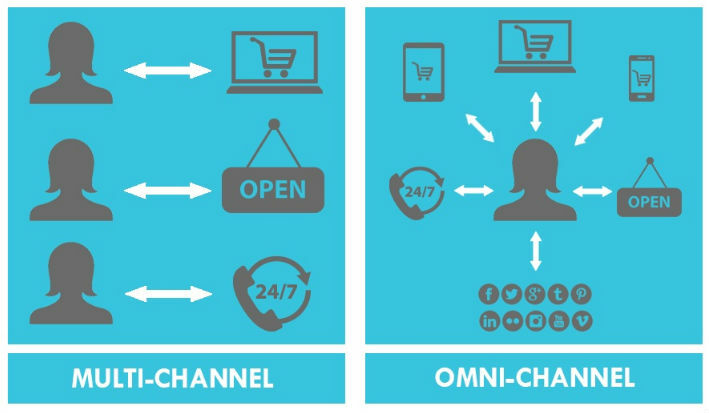 The other benefit of having multiple sales channels is that you won’t be left in the lurch if it fails for any reason. Next time you tend to non hush-hush business operations, consider documenting or even live streaming it as an event. In the past I worked at an IT hardware distribution company. Every time we got a new shipment of products in, it was cause for celebration because our target market would get really excited about new arrivals and updated stocks, especially if they had been waiting for new supplies. Our CEO would take photos of the delightful new goods and post it on our media pages himself because it was so effortless to engage in such an rewarding manner with our audience. It wasn’t a time where live streaming such events would have been a priority enough to go through the hassle of setting it up the tech for it, so photos sufficed. 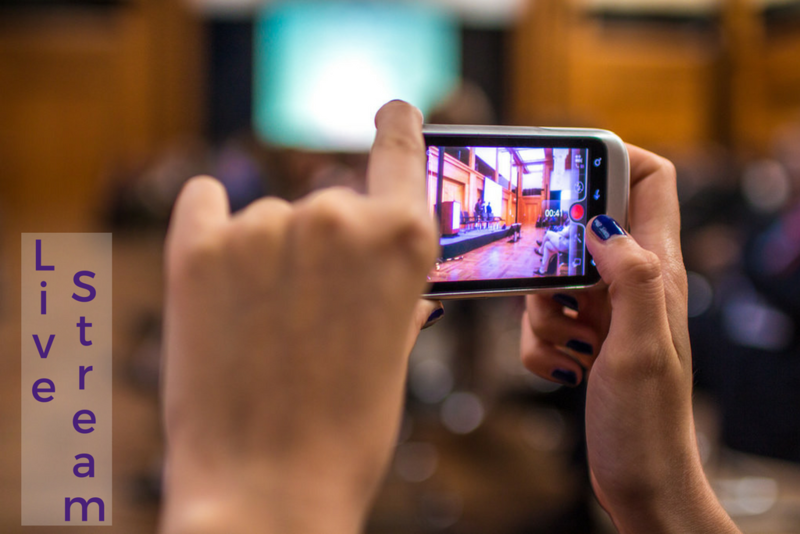 Now, technology has advanced to the point where all you need is your phone and you can live stream events that your audiences will enjoy: a behind the scenes look at what goes on with your business. This sort of content gives life to your organization. The human touch will help you seamlessly engage with the public you want to reach because sharing your routines gives your audience a glimpse into the actual human beings behind the products and services you offer. Every product makes a promise to the buyer: to change their life for the better. Before buying, however, people want to see how -and in what context- a product is used. If you choose to improve your product image aesthetics, then start by adding lifestyle images to your product pages. Lifestyle product images sell a customer on a piece by helping them visualize it in context since they display your product features in real-time. The common white backdrop product image won’t tell a story. 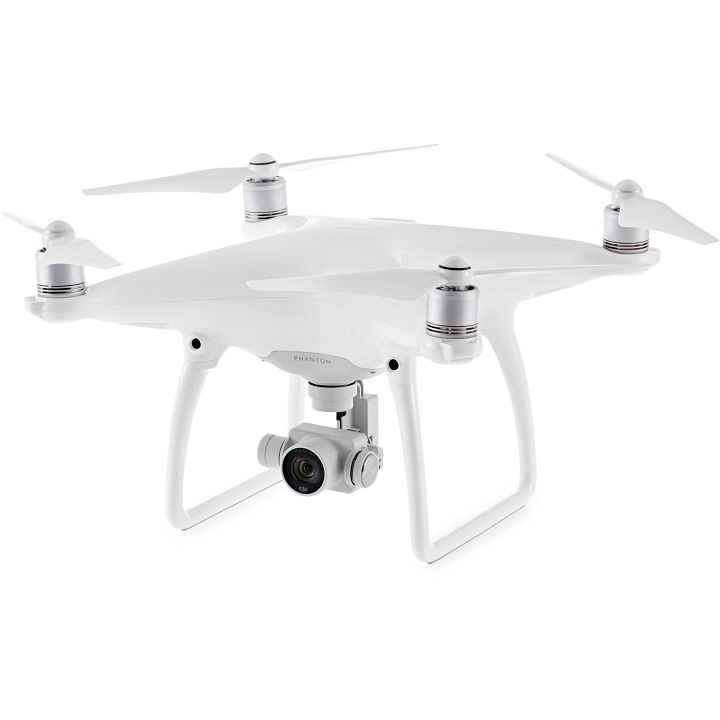 The DJI Phantom 4 is shown clearly against the typical white backdrop. It’s a good quality image but without context it lacks the ability to evoke emotion, or convey any meaningful information. 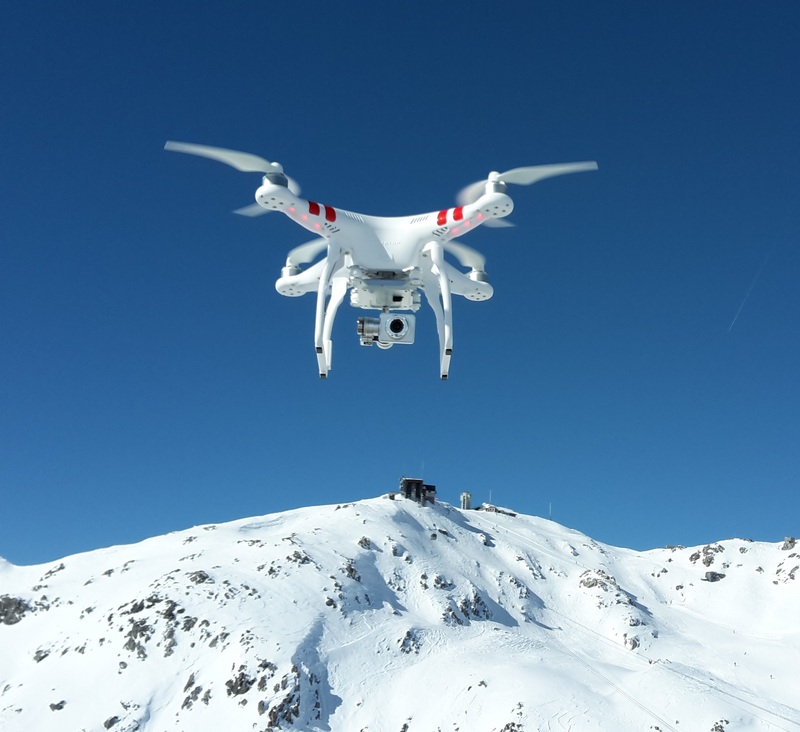 In this case the Phantom 4 is displayed with context! Looking at the image you can clearly see the size of it, which I couldn’t from looking at just the first image. Imagine if this were a thermostat or desk and all you had was the first shot. You make the purchase but when it arrives it might not fit in your space. Having a lifestyle image would have given you the information you needed to decide perhaps it would be better suited elsewhere. This is information you can help customers to glean from product images. After all, eCommerce merchants need to make up for the lack of tactile fulfillment that physical retailers can offer. When you want to take it to a whole new level, these sort of lifestyle images -ones with the product in action- have the ability to inspire emotion and imagination in customers. Someone viewing it will start fantasizing about possibilities and envisioning scenarios of how they would use it if they had it themselves. Powerful indeed. 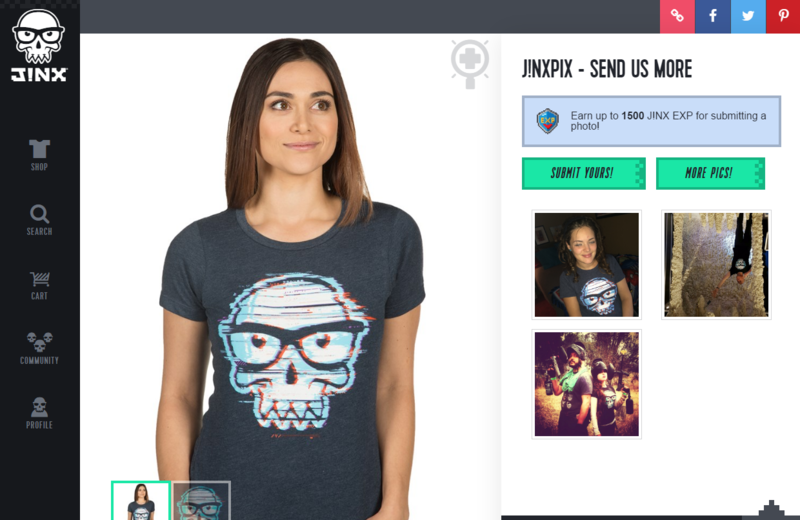 Gamifying the entire eCommerce experience for their visitors. If you’ve an abundance of energy, produce and add several lifestyle images, then go a step further and devise a plan to get your customers on board by hosting pictures of them with their purchases. You can entice customers to participate by gamifying the process or rewarding them for each post they make, but really, gamification is an entire topic of its own. If you enjoy planning and keeping activities organised, there’s a good chance you already have a content schedule in place. If not, this could be your time to start, at least for keeping your social media organized. I limit each period(month or quarter) to a maximum of two general themes. For example if running a baby/motherhood website, I’d focus on mothers as well as families during the month of May (women’s day), and dedicate November for content focused on children (children’s day). 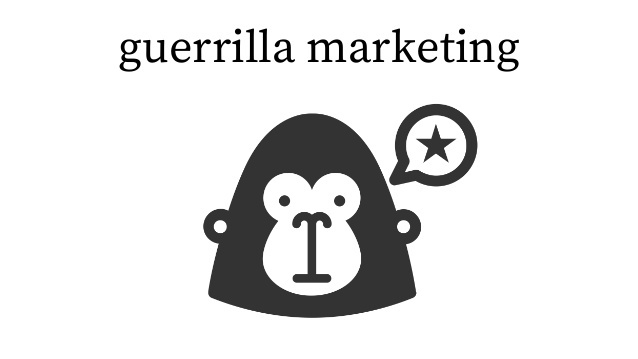 As with a blogging content calendar, be topical but also try to stay relevant to your industry. I use a simple Google spreadsheet to plan and keep track of everything, but you can use Excel if you prefer. Personally I hardly do anything on local (being a digital marketer and all) so I use Google Sheets. I find it sufficient for these sort of tasks since it’s live, shareable instantly, and I can link between documents, sheets and presentations easily. This is our yearly outline sheet. In it I include periodic themes and schedule the minimum amount of content to be produced. Since this is a new year resolution post, you may find it helpful and motivating to see your progress. 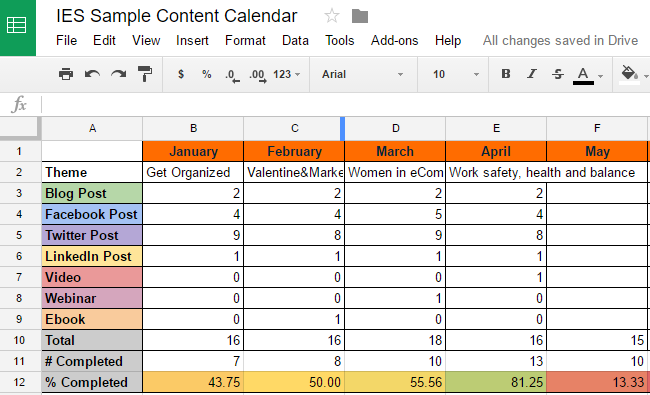 To that end I’ve included two rows that show completion rates for each month as well as a yearly summary. Add whichever channels you produce content for and determine your posting schedule. If you’ve no idea how much you can take on, don’t worry. Start small and do what you can. If you are already pressed for time there’s no point planning for 10 posts a day if you’re not able to execute it. 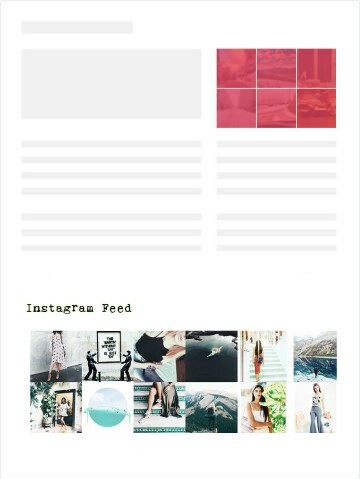 Instagram and Pinterest are not strong channels for us so eventhough InstanteStore does have official accounts on those platforms, I don’t plan for content promotion on those channels. I prioritize tasks to leverage where our strengths lie, and you should too. 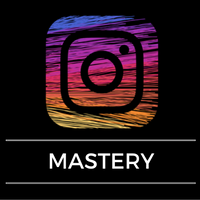 So if you find IG effective to reach your audience compared to Twitter then prioritize that and add it to your plan instead. Things like videos take more time and effort to make, so I schedule it more conservatively, perhaps once a quarter or even a year. A webinar could double as the video content so I schedule it for before the video content. On the following sheets are the monthly views that go into detail about the daily activity for each month, with auto-updated counts for total of posts per month. Remember I said I can easily link between documents? This is where I do just that. This is the crafting bench, so to speak. I use Google Slides as a canvas to draft concepts and the content copy, as well as come up with ideas for the post visuals. The image above shows the final result of a fully drafted post. In this case the posts are the pre-emptive messages before the actual blog post, which is the one you are reading right now. With the entire year mapped out, it will free up the rest of your calendar for other priorities, or even leisure! 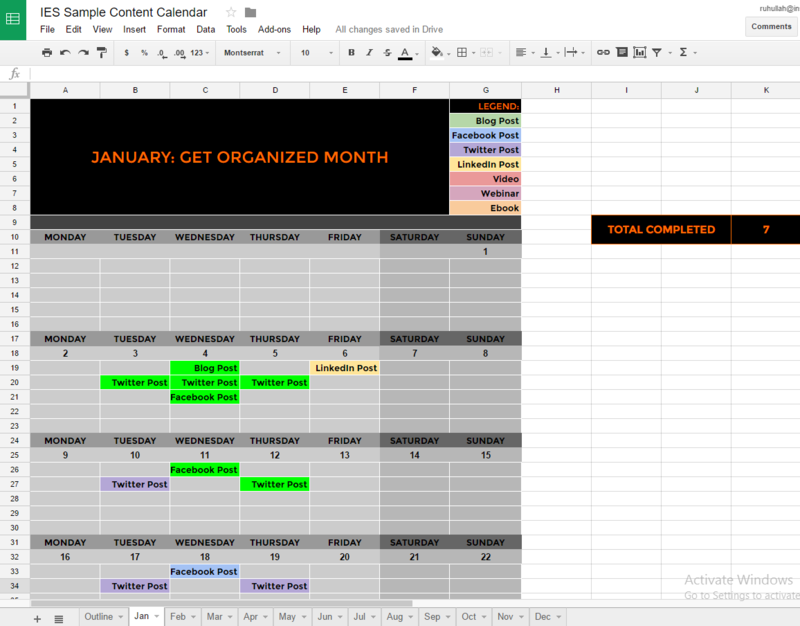 You don’t have to create content for the entire year right away, but having a structured content plan in place will help you stay ahead of deadlines while keeping your mind clear and focused on your goals. Once again, thanks for reading our eCommerce blog. We hope you’ve found it valuable. We’re looking forward to becoming the top eCommerce blog of 2017 (and beyond)! 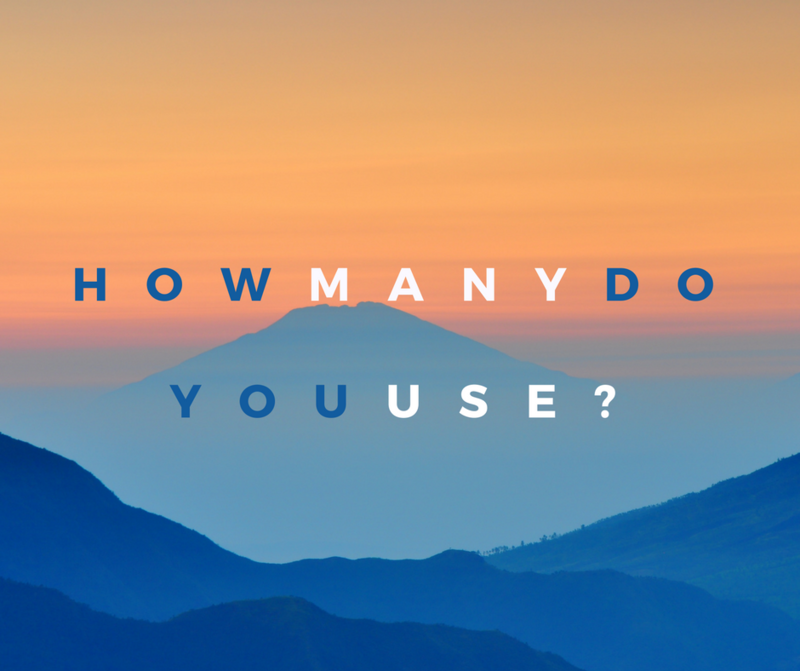 Are there any you use that we didn’t include? which also includes Four Additional Features not listed here. 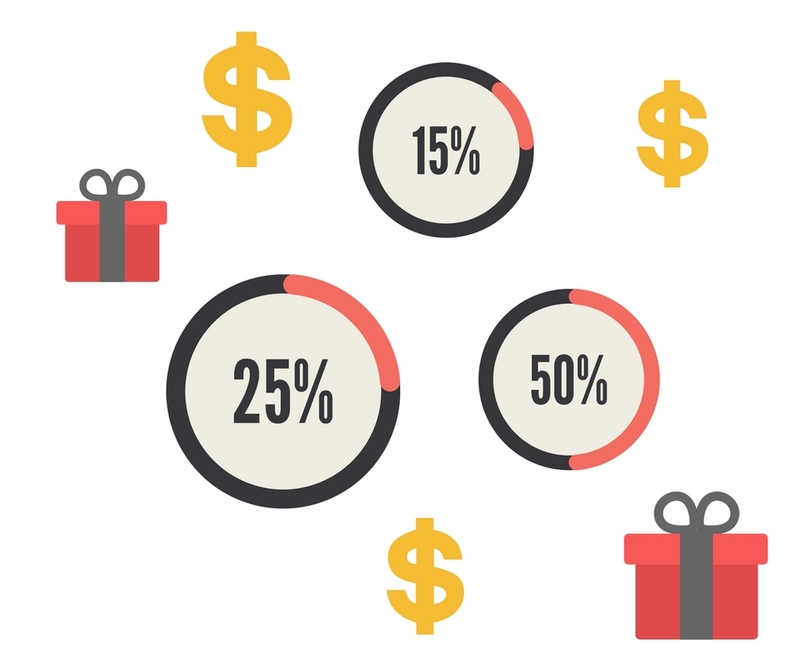 Are You Using THE ONE Proven Tactic to Boost You Black Friday Sales By Up to 320%? Did you know that there are less than 4 days before the biggest sales period of the year? Both Black Friday & Cyber Monday are set to rake in the lion’s share of sales this season as holiday shoppers scour the web for the best deals. 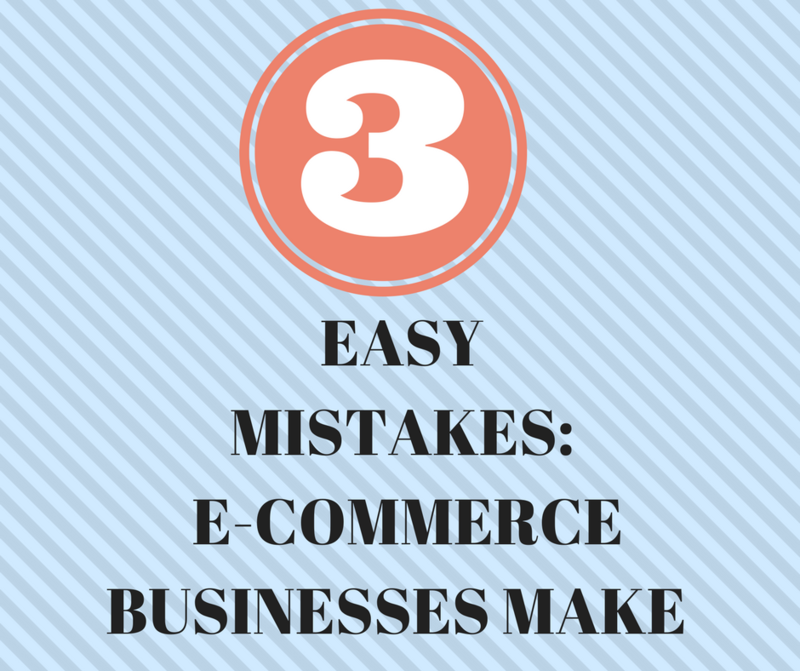 So is your eCommerce store ready for the year end shopping galore? What have you prepared to OFFER your customers?